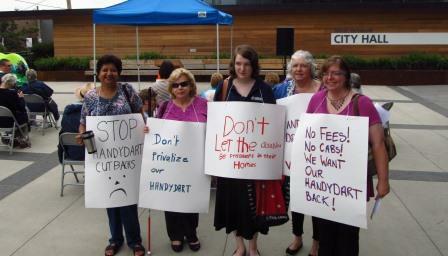 On Wed Dec. 9th, Speak out for Better HandyDART Service! For years, the TransLink Board has met behind closed doors, but thanks to public pressure they will be meeting in public on Wednesday December 9, 2015. And HandyDART riders need to be there to demand better service! The location is Room #400 – 287 Nelson’s Court New Westminster, near Sapperton SkyTrain Station (up a steep hill). The meeting starts at 9am and the scheduled time for speakers from the public is 11am to 12 noon. Please join us there at 10:30 am and bring a sign! Sign up to speak starting Dec 2nd at www.translink.ca/en/About-Us/Governance-and-Board/Board-of-Directors/Board-Meetings.aspx – call TransLink at 778.375.7602 for more information. Please help spread the word! Print some leaflets – PDF file. Invite friends on Facebook. HandyDART service hours have been frozen since 2009, and as a result trip denials went up over 600% before the private contractor changed procedures to disguise the crisis. Service quality has also deteriorated, with riders routinely forced to wait for hours. In 2013, TransLink transferred 10,000 service hours from HandyDART buses to taxis, which endangers many riders. To have quality HandyDART service that meets the needs of people with disabilities and older seniors, HandyDART must either be brought in-house as a TransLink subsidiary or turned over to a non-profit agency. Experience shows private corporations cost more and put profits above quality service. Everyone benefits from better transit, including the growing population of seniors and people with disabilities. It is time to make major investments in public transit, including HandyDART, to make Metro Vancouver a livable and age friendly region. This is from my blog. Drivers are greeted with jobs, economic opportunities, better access to just about any available service, can save money by shopping around at more than one location, can choose when to leave and when to go home, etc. Driving privilege as a whole needs to be questioned and why society assumes non-drivers, particularly among people with disabilities, don’t need all those things that drivers take for granted. 2017 BC Elections is a good year to start a ‘RIGHT THE WRONGS CAMPAIGN’ to correct the BC problems existing in TRANSLINK. About 36 years ago government introduced the South Coast British Columbia Transportation Act – TransLink. The prime purpose was to create a transit system that would provide an alternate way other than automobile. Since it has undergone numerous and confusing amendments to make it what it is now, an organization very much failing according to reports this year. The transit system in its entirety is vital in the South Coast of BC. The numbers of people it moves grows exponentially annually TransLink reports indicate funding problems based on TransLink income. It therefore is cutting back on services. Handydart has had its budget frozen for10 years for example. At the same time governments are pressed for financing. A problem faced because of a wrong-ended tax policy of reducing taxes on big business. Consider, if the workers did not have transit it would impact on profits. If customers could not get to the malls or stores again their profits would suffer. There are more. The present TransLink first moved to taxis this year. It is a poor choice. Taxis are fine to substitute infrequently for bus rides. However it is inadequate for regular use. HandyDART is a door-to-door service; taxis up to now are not functioning door to door despite claims by TransLink they are. The first question seems to be where is the money to come from? We need to elect a government unafraid to make all taxation fair and equitable. The time has come to make Business and High Finance pay a fair share of the tax burden. TransLink has spent monumental amounts of money on road improvement, bridges and other highway improvements. Money, given to the Department of Highways instead should be used to allow TransLink to work on people movers. The money saved here could well be in the billions. Next it is time to right the wrongs begun under the Campbell Premiership. Return TransLink Board to a mainly elected board of Mayors they are elected, it is more democratic. They know better transit problems in their area and are subject to their people’s approval through elections. The existing Board of professionals should be removed with a thank you only. Make all business corporations under TransLink non-contracted services by removing ‘contracted service’ from the ones that use contracts. This or year is an elections year. Voters have a chance to demand that your candidate, if elected, will do all in their power to make these three points in our position government policy. It would go a long way to improve public transit in the lower mainland. (South Coast BC). Vote for a government unafraid to introduce fair taxation.